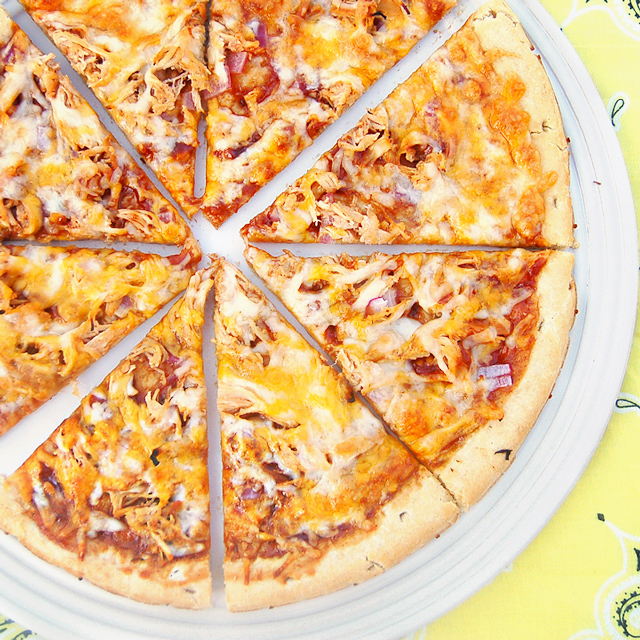 If you’re looking for a quick and delicious dinner, this Barbecue Chicken Pizza is it! We’ve eaten it multiple times in the last couple of weeks. I’ve made it using different crusts each time. I even made a diet version using the Flat-Out Bread and low fat cheese. I used both pre-cooked chicken from the freezer and leftover barbecue chicken breasts and it has been awesome each time. When assembling the pizza, I didn’t really measure my ingredients, I just used what looked right. Like this recipe? Dont forget to pin it! Great recipe, Jamie! This is one of our favorite pizzas when we eat out. Now, thanks to you, I can make it at home! My mouth is watering! I am visiting from Thee Blog Hop and I am a new follower! I hope you will drop by http://www.garagesalesrus.blogspot.com/ and do the same. Oh that does look yummy. My boys love pizza. My husband has been wanting me to make one of these for a while now – this looks delicious & very do-able! 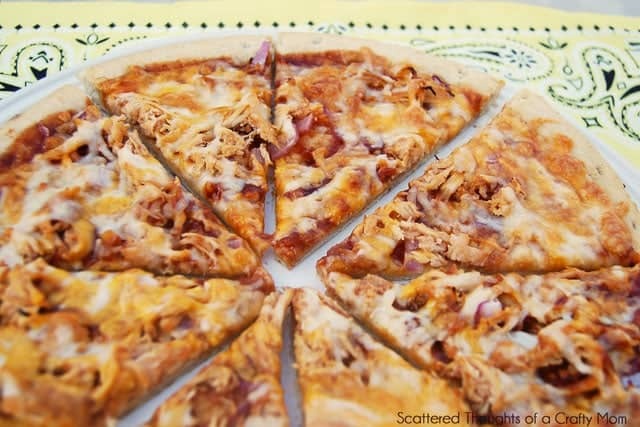 I'm serving BBQ chicken pizza for dinner this weekend and was looking for a great recipe. I'm going to use yours! I love making pizza and that looks wonderful! Pinning it! Thanks so much for sharing at Pin It and Win It Wednesday @ http://www.cheapcraftymama.com!! Mmmm this and philly cheese steak pizza are my two faves. I gotta make this! We just love a B-B-Q Chicken Pizza and your recipe looks delicious! Hope you have a great holiday week end and thanks so much for sharing with Full Plate Thursday. 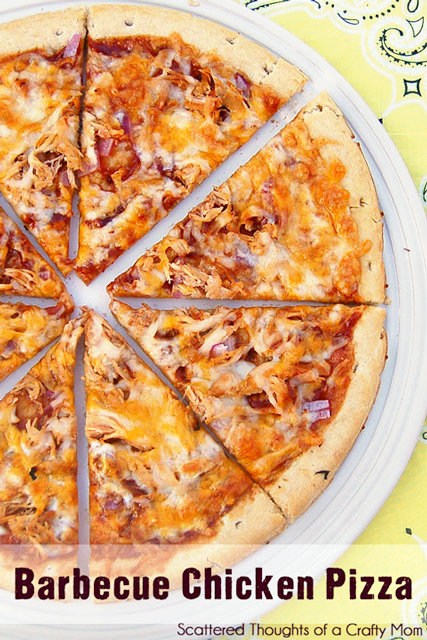 We just love Bar-B-Q Chicken pizza. Yours looks delicious~makes me want to make one right now. Oh my word – that is superb! I love bbq, pizza and chicken! Must try this! This looks awesome. I will be featuring it tonight at my Swing into Spring party. Please stop by and pick up an I've Been Featured button. Thanks. Yum! That looks good…perfect for summer. I'd love it if you would consider sharing it with our Summer Recipes linky party. We're two blogs sharing one combined linky party for double exposure. Stopping by to let you know that I featured this post on my blog today. 🙂 Stop by to grab a button, if you want! This was awesome!!! Thanks for sharing your recipe!!! This is a very nice chicken dish. Would you be happy to link it in to my Chicken Edition of Food on Friday? This is the link . I found you again via It's a Keeper's Thursday link up.